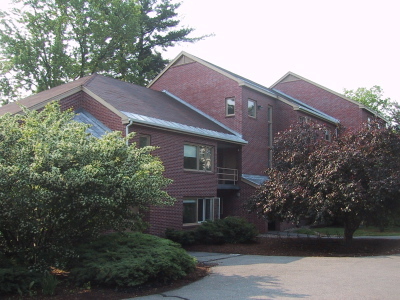 Commonly known as "B-Dorm," Jenkins Hall was built in the fall of 1977 and was ready for students in the fall of 1978. Along with its neighbor, Taplin, Jenkins was part of a quick solution to an urgent housing crunch. 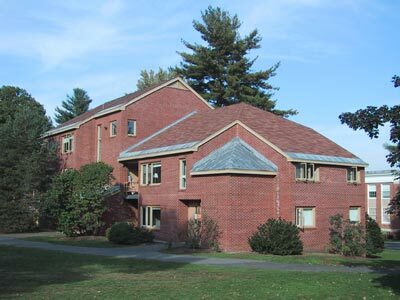 In the Amherst Student of September 15, 1977, an article about the planned construction discussed the possibility of the College taking over the Lord Jeffrey Inn for student housing, but reported that the trustees decided not to, and wanted instead to use the building for a new social center. (Archives & Special Collections, Buildings and Grounds Collection, box 18, folder 7). For the continued story of the quest for a social center, see The Campus: Fayerweather. (Photographs taken 12 October 2001 and 1 June 2002).